Scott Miles was a frequent visitor to Swanage Lifeboat Station and spent many hours at sea. His family chose to put the funds given in his memory to the Swanage Lifeboat Station. Since then, the volunteer crew have been waiting for a suitable cause to put this money towards, which would be a fitting tribute to Scott. 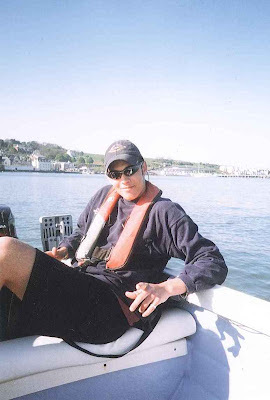 Scott was a great advocate of always wearing a lifejacket and when the Swanage volunteer crew were advised that they would be running an appeal to fund replacement lifejackets, they contacted the family to find out if they would be happy to support this idea. The family were delighted with the suggestion and as a result, six of the all-weather lifeboat lifejackets and three inshore lifeboat lifejackets will be funded in Scott’s memory. This is enough lifejackets for both boats to go to sea, however, the station also holds a few extra lifejackets for shore crew and additional crew that may need to go to sea (for example in search conditions, when you require as many eyes on the lookout as possible). Money raised from the Swanage RNLI SOS day events have been allocated to this special appeal to fund these extra lifejackets. In what has become an annual tradition the Swanage RNLI volunteers hosted a carwash raising £990, a collection at the Co-Op totalling £131 and provided refreshments at the Catholic Hall making £493. These record breaking amounts together with funds raised from other local collections took Swanage’s SOS total to a fantastic £1647! This fundraising total on top of the funds from Scott’s memorial fund will provide the money needed to purchase the new lifejackets.